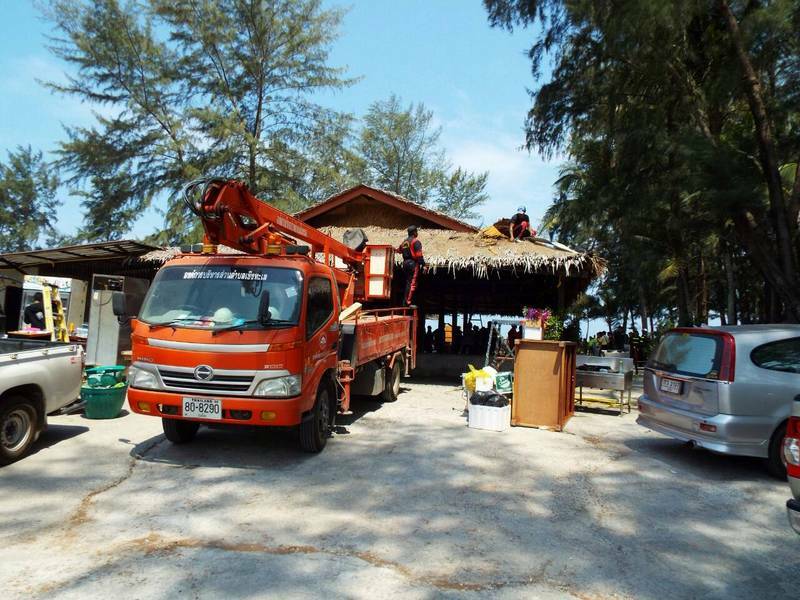 PHUKET: The move to clear businesses from Phuket beachfronts continued today (Apr 27) when officials began dismantling structures along Layan and Leypang beaches. The move follows the high-profile clearing of Surin Beach last week. However, officials today began deconstructing the structures, instead of crushing them with large excavators as done in carrying out the Surin beach demolitions last Wednesday (Apr 20). (See story here). “We cannot demolish the buildings here like we did at Surin, because at Surin the government was demolishing its own buildings. Here, we have the right to remove the structures, but not destroy them,” explained Ma Ann Samran, Chief of the Cherng Talay Tambon Administration Organisation (OrBorTor). 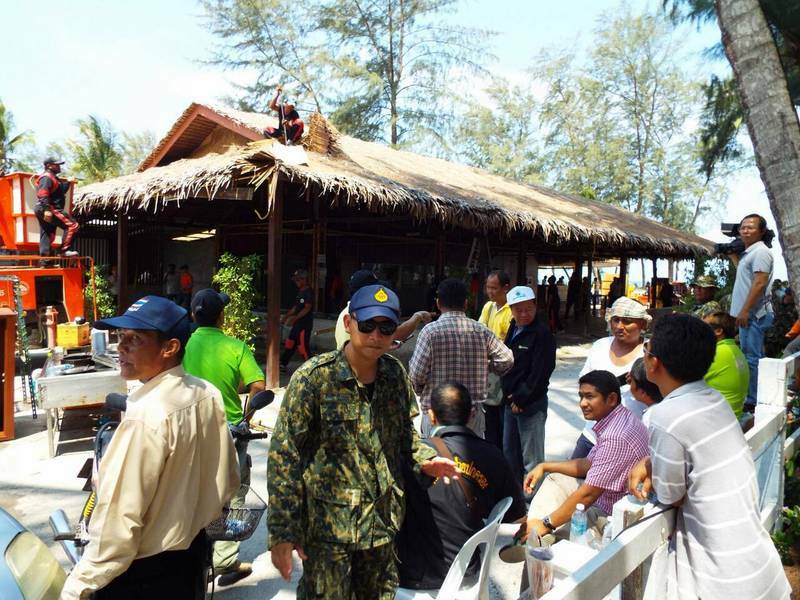 The contingent of more than 100 officers at the site included Royal Thai Navy security personnel and police acting under orders of Phuket Provincial Police Deputy Commander Col Saman Chainarong. However, objections by Tony Restaurant owner Kanokpol Somrak this morning delayed workers by only an hour before they began pulling down the restaurant. 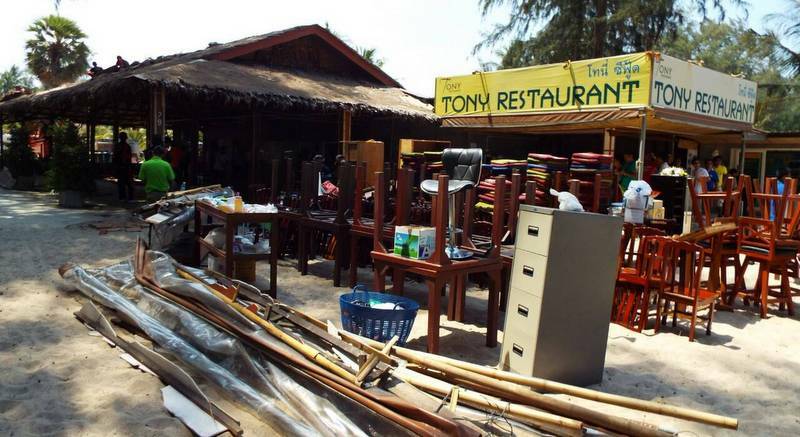 “Today eight shops will be removed at Leypang and Layan Beaches, and the first restaurant to go is Tony Restaurant because it is the biggest among the eight,” said Vice Governor Chokdee Amornwat. “The owner, Kanokpol Somrak, showed up with legal documents and tried to stop officials from proceeding. He insisted that he had the right to operate his restaurant while his case is being heard by the Administrative Court, but his attempt failed to stop the demolition after we reviewed his papers and talked to him,” V/Gov Chokdee added. 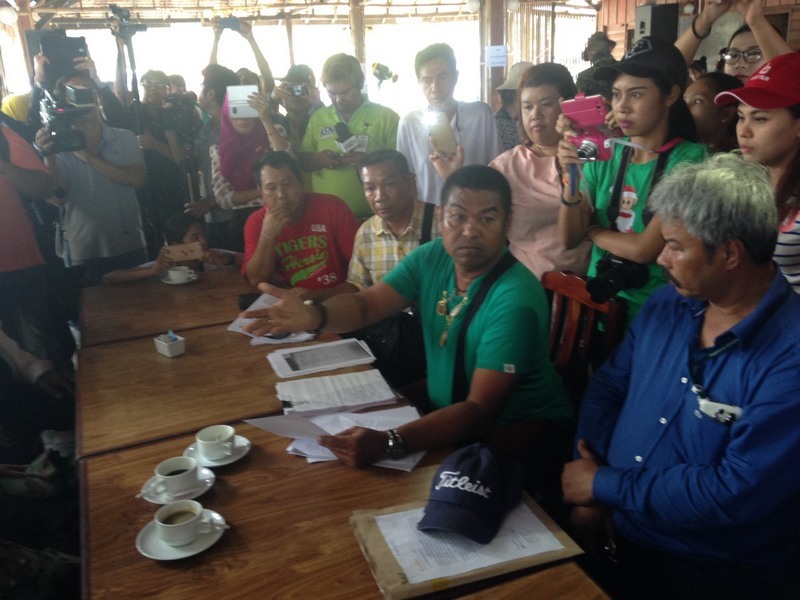 Noopadon Juntanoo, an officer with the Cherng Talay (OrBorTor), explained to The Phuket News that Mr Kamol presented a court order preventing the demolition. “But that was outdated and superceded by the court’s decision to reject that appeal,” he said. Mr MaAnn added, “There are 10 businesses on Leypang Beach that will be removed, but today we will remove only eight because appeals filed by two of businesses are still being heard by the Administrative Court. We have to wait 30 days for the court’s decision before we can proceed. “The beach covers 178 rai, and after the demolitions are complete, the entire area will be left as public beach,” Mr MaAnn said. “We are waiting for the Land Office to issue a public land document, or NorSorLor, specifically for this area so there will be no further arguments about whether or not this is public land,’ he added. The question was about beach ownership and customary usage from dull Kurt. Wake up. "Up to the trash..." was a joke, (only it isn't. )Er,..thanks for the correction, I'll skip the " research on International law regarding territoriality by States and trusts, then the Law of the Sea..." and take your word for.... um what am I taking your word for? Another uninformed zinger from you know who. Joey...Christy's comment was tongue-in-cheek, and if you had spent any amount of time on the beaches of Phuket, you would know exactly what she's talking about. I'm guessing that every commentor below knows what she is talking about, leaving only you that just doesn't get it. Christy... you too had better check the definiton under Thai Land law. It seems the "everyone knows" is just you. Read also the final sentence in my reply to rorii. Merv is 100% correct. Everyone knows the beach boundary in Thailand starts at the  low water mark and goes all the way up to the trash. Rorri...once again the area between low and high tides does not belong to the King. You were told to look at the definitions. Even if you are not bothered other readers may wish to do so and figure things out. Failing that, consult a lawyer. Also, do some research on International law regarding territoriality by States and trusts, then the Law of the Sea. Joe12, not that long ago jetskis were made to anchor offshore as they were, by law, forbidden on the beach, but as usual, as time goes by, and "tea money" paid, that law is ignored.The reason given for the ban, beaches belong to the King, etc. Beach, as defined, is the land between low and high tide. Rorri.. no ... ownership of a "beach" does not vest in the king. Best you and dull kurt check on thai land law particularly definitions therefore what you say is incorrect so there can be no law that states the sea or beach cannot be used for commercial gain. Take for example jet skis or tour boats Merv is 100% correct. Different story past high water mark which merv correctly stated. That joe12 must have a bad day. Feel sorry for him. Not only he still not write his own comments, now he started to be Merv's godfather. The suggestion to accept mervs' 'factual' answer what a beach is made me laugh. Kurt...if you don't accept Merv's factual answer of "beach", then research it yourself as it's clear you are not going to accept anything that anyone says so there is no point in you asking. Ed... oops, merv...oops Joe12, as ALL beaches belong to the king, and by law can not be used for commercial gain then no matter what "title" anyone holds, they have NO right to use the beach. The word 'damn' used here several times by someone who even regularly is more insulting people who comment with sort of language use we should ignore. I still read contradictive in merve's comment. It doesn't make sense when you read it well and think well about it. And I actually do not understand why a Joe12 jumps into this. That guy never write his own comments. Kurt...read what Merv said. He damn well told you, so why keep asking? If you can't understand that, it means you have a mental problem or more politely "inadequate." Kurt asked a question: Is a beach, covering 178 rai, land or no land as merv stated? Asking a question is not telling readers 'inadequacies'. Kurt...merv gave a pefectly good factual answer. Read the damn thing. If you can't understand it, don't bother telling readers of your inadequacies. Merve: the article is clear in reporting that the beach covers 178 rai. And once it is cleared it will be left as public beach. Now they are waiting for the Land Office to secure this beach with a public land document,( NorSorLor). So this 178 rai beach area is land. That a beach would not be 'land', well,....? Is a thai beach not land? KURT: Once again drivel. A nor sor lor document gives the holder a right of usage. A beach is a beach, it is not land. This is a nor sor land explanation: A Nor Sor Lor document can specify that particular groups have rights to use public land based on cultural and heritage links. One thing I not understand. As by thai law all beaches in Thailand are public beaches, I think all thai beaches automatically have a NorSorLor public land document/status to prevent private people to bluff, set up their private unlicensed business, not pay taxes ( only tea money to corrupt authorities) and threaten you off that  public beach. Well, Richard Vickers,.. Probably khun Tony doesn't understand the meaning of the word 'illegal'. Perhaps, seen all the amulets he is dressed up with, he feels that makes him unique and untouchable. His face expression shows what you expressed. Of course, khun Tony has been able to be illegal for many years because the local government officers did allow him.